It is difficult to say precisely at what point in time or where exactly Jiu-Jitsu originated. Despite the efforts of many historians and evidence pointing to Buddhist monks in India, basic elements of grappling can be traced back to places like Greece, India, China, Rome, and even Native America. When trying to understand the ultimate source of Brazilian Jiu-Jitsu, one must avoid the simplification of attributing its creation to a person, group, or period in time. Jiu-Jitsu, as we understand it today, is a natural and intuitive way of fighting that has rudimentary manifestations in various cultures in different historic moments. But a martial art is comprised of more than just techniques or fighting strategies. The philosophy that defines the purpose of practice, and the moral code of the practitioners, is a powerful element that determines not only the direction of technical development, but the survival or death of the art itself. Looking from that point of view, it then makes perfect sense to associate Buddhist monks in India around 2,000 B.C. with the origins of Jiu-Jitsu. The Buddhist value system of deep respect for all forms of life allowed the development of such a system of self-defense that aimed to neutralize an aggression without necessarily harming the aggressor. 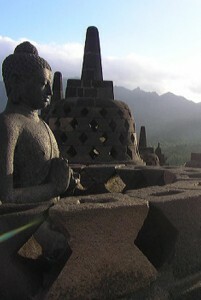 Wrapped around important Buddhist principles like acting in a non-harmful way, and the pursuit of self-mastery and enlightenment, Jiu-Jitsu served well the self-defense needs of monks and spread throughout Asia towards China and later Japan, following the Buddhism expansion on that continent. 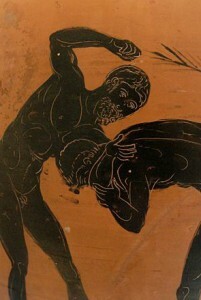 While it is safe to assume that rudimentary versions of Jiu-Jitsu appeared in many cultures in different points in time, it was the feudal Japan of the second millennia A.C that the art encountered a fertile environment, allowing it to flourish and establish itself as a widespread style of combat. In a country fragmented by the feudal system, with each feud having its own set of warriors ? 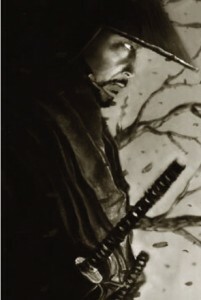 the samurai ? Jiu- Jitsu became a necessary fighting skill for combat survival. But the term “Jiu-Jitsu” (jujutsu) was not coined until the 17th A.C century, after which time it became a blanket term for a wide variety of grappling-related disciplines. Jiu-Jitsu evolved among the samurai as a method for defeating an armed and armored opponent without weapons. Because striking against an armored opponent proved ineffective, practitioners learned that the most efficient methods for neutralizing an enemy took the form of pins, joint locks, and throws. These techniques were developed around the principle of using an attacker’s energy against him, rather than directly opposing it. However, with the Meiji Restoration, a political movement that put an end to the Japanese feudal system and triggered the industrialization of that country, the prestigious class of the samurai lost its primary importance. 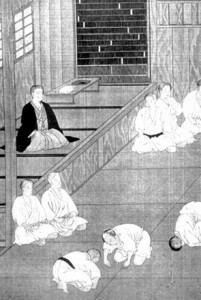 The radical political, cultural, and social transformations that took place in Japan in the 19th century, made Jiu-Jitsu gravitate from a reputable art of combat to illegal practice, as the government made efforts to reprimand the bloody combats that were taking place from the jobless former Samurais and there disciples. 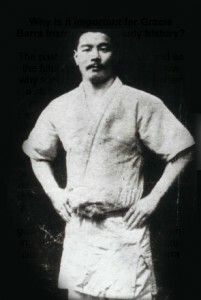 Jigoro Kano (1860-1938), member of the Japanese Ministry of Culture and Martial Artist, played an important role in rescuing Jiu-Jitsu’s reputation in times of peace. Kano understood how Jiu-Jitsu could serve not only as a combat tool, but also as an effective way to educate the individual and allow men and women to embrace a more balanced lifestyle by developing their potential. In other words, Kano realized Jiu-Jitsu could be used as a powerful educational tool that could support the development of any human being and envisioned it supporting the Japanese goals for social and economic development. Complementing his updated training philosophy, Kano made an effort to adopt new training methods and remove dangerous techniques. These changes allowed practitioners to engage in safe, but intense training drills with full resistance ? what we know as sparring or live training today. This new philosophical and methodological approach to the practice of Jiu-Jitsu created a very positive impact on the Japanese society. It helped Jiu-Jitsu regain its social status that had been declining since the Meiji Restoration. The new approach became famous back then as Kano Jiu-Jitsu and later on as Judo. In conjunction with Kano’s deep training philosophy and innovative training methods, many rules were introduced in order to redefine the focus of practice. The ground fighting ? the backbone of Brazilian Jiu-Jitsu ? was minimized and restricted to a few moves. That created an interesting paradox: while Kano’s reforms contributed tremendously to the survival of a millenary martial art tradition, the focus on take downs created a fragmented fighting style that lost the connection with the essence of Jiu-Jitsu and the reality of real combat. In parallel to the regained reputation of Jiu-Jitsu in Japanese society, came a decline of ground fighting, the most powerful set of skills Jiu-Jitsu had to offer. Among Kano’s remarkable students, though was Mitsuyu Maeda, a fighter who benefited from Kano’s innovations, but who had his roots in other Jiu-Jitsu schools that emphasized ground fighting and self-defense skills under real combat situations. Maeda, who later became famous as Count Koma, had above average skills and was sent overseas to help spread Jiu-Jitsu to different cultures in the world. After traveling to many countries including the US, Central America, and Europe, Maeda landed in Brazil in 1914. There he would meet a young boy named Carlos Gracie and plant the seed that would keep alive the essence of Jiu-Jitsu. A champion in his own right and student of Jigoro Kano, Maeda began his travels abroad with a group of men who participated in challenge matches across the globe. In 1914 he landed in the northern state of Para, Brazil, to help establish the Japanese colony in that region. Settling down in Belem do Para, it was natural for Maeda to make use of his outstanding fighting skills in demonstrations, shows, and even circuses as a way to make a living and spread the Japanese Culture. The first time Carlos Gracie met Count Koma, was at one of these demonstrations. Carlos was amazed by Koma’s ability to defeat other opponents who were much bigger and stronger than him. Carlos Gracie was a wild kid who was slipping out of control and away from his father, Gastao and mother, Cesalina. Energetic and rebellious, Carlos was giving them a lot of trouble. Knowing that Maeda just started a Jiu-Jitsu program in town, Gastao decided to take Carlos there to learn from the Japanese as a way to calm down and discipline his son. 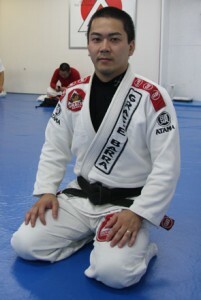 Mitsuyu Maeda introduced Carlos to Jiu-Jitsu, at the age of 14. He became an avid student for a few years. The studies under Maeda had a profound impact on his mind. He never before sensed the level of self-control and self-confidence Jiu- Jitsu practice allowed him to experience. The connection he felt with his body in each training session allowed Carlos to gain a deeper understanding about his nature, limitations, and strengths, and brought him a sense of peace that he never felt before in his life. The times with Maeda did not last for long, though. Less then 5 years from the day he started, Carlos had to move to Rio de Janeiro with his parents and siblings. Arriving at the then capital of Brazil at the age of 20, Carlos Gracie had difficulties adapting to a normal life and working at a regular job. Even though he worked in governmental institutions, Carlos’ wild spirit would not allow him to settle down. His desire to teach the art he learned from Maeda was already burning and he decided to go after it. The profession of Martial Arts instructor at the beginning of the 20th century in Brazil was not exactly the most promising. People’s awareness about it was practically nonexistent, making it really hard to find students who would be willing to pay a tuition in exchange for instruction. The only people to see value in what Carlos Gracie had to teach were Law Enforcement officials. An opportunity finally arose for Carlos to teach outside of Rio de Janeiro, in the state of Minas Gerais. The passion for Jiu-Jitsu and Koma’s dedication to make him a Champion, allowed Carlos to discover a new meaning in his life. From then on, Carlos started to use and see Jiu-Jitsu as a tool to help him find his way through the world. More than that, with time, he elected Jiu-Jitsu as an ideal worth fighting for and embraced it with strength and determination. Reila Gracie had good opportunities to make a living. After a few years in Minas, Carlos decided to move to Sao Paulo and then back to Rio. His free spirit and faith in the great things Jiu-Jitsu could do for common people seemed to have made it hard for him to restrict his teachings to police officers and members of law enforcement agencies. 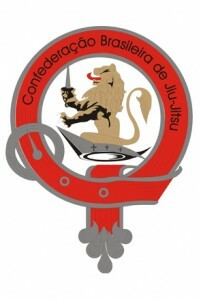 The first Gracie Brazilian Jiu-Jitsu School was founded in 1925 at Rua Marquês de Abrantes 106, Rio de Janeiro, Brazil. At the age of 23 years old, Carlos Gracie understood well the amazing benefits Jiu-Jitsu could bring to one’s life. Founding a school represented a very important milestone in his decision to grow Jiu-Jitsu Gracie as a national sport in Brazil. The Marquês de Abrantes school was not exactly what one would expect as the pioneer power house of Gracie Brazilian Jiu-Jitsu. With limited resources and concerned with the well being of his younger brothers, all Carlos could afford was a small house where he turned the living room into a training area. In that house Carlos united his brothers and engaged them in his life project. He knew it would be impossible to accomplish such a gigantic task alone and started to teach his younger brothers, Oswaldo (1904), Gastao (1906), George (1911), and Helio (1913). The first generation of Gracie brothers living and working in the same house seems to have forged the family spirit that flowed down through generations and was so important to the extraordinary success the Gracie Family achieved over the years. 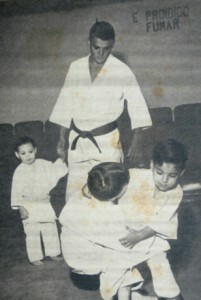 Helio Gracie was just a kid when the Marques de Abrantes school opened its doors in 1925. At 12 years old, he was too young to help with the classes or in the running of the school. Carlos was really busy teaching and managing the family business, so Helio’s first lessons in BJJ were delegated to his other brothers, Gastao and Oswaldo. It was not until later that Carlos started to notice Helio’s talent, and dedicated more time to teach and train him. Helio’s small size and relatively weak physical condition made it difficult to execute some of the positions properly. In order to progress and earn the attention and admiration of his older brothers, especially Carlos, Helio had to research alternate jiu-jitsu methods, which worked for him. His discoveries emphasized leverage and timing over strength and speed. 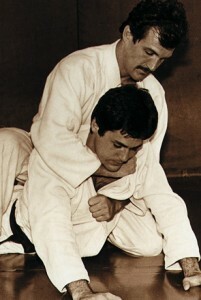 The adaptations of techniques Helio learned from his brothers were mastered through trial and error with the end result being the further development and refinement of the Jiu-Jitsu Gracie. Under the tutelage of his brother, instructor, and mentor Carlos, Helio participated in countless fights, including a 3 hour 43 minute fight against a former student, Valdemar Santana. Helio’s courage, tenacity, and discipline turned him into a national hero. As Carlos grew older and became more dedicated to his research in nutrition and exercise, and more committed to his quest for spiritual enlightenment, Helio took over the family business and became really involved in running the Gracie School. At this point, it was a much bigger facility located in downtown Rio de Janeiro. Carlos, Gastao, Oswaldo, and Helio built the first generation of Gracie fighters. Although Carlos and Helio ended up being really close and spending decades working and living together, all four brothers had an enormous contribution to the growth of Jiu-Jitsu in Brazil in the first half of the 20th century. 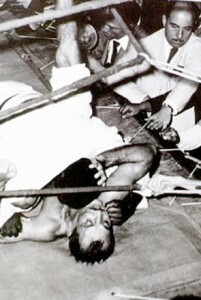 Carlson Gracie (1932) emerged as the family’s number one fighter right after Helio’s defeat to Valdemar Santana in 1955. At the age of 43, Helio could not maintain the physical level required to allow him to compete at his best. 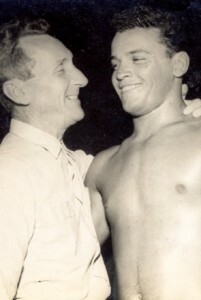 The reputation of the Gracie family was hurt when Valdemar, a former student, defeated Helio Gracie, so Carlson was called upon to bring the family name back to the top. Carlson defeated Valdemar Santana and moved on to become the main fighter of the family for decades to come. His many battles in the ring made him a famous young man and fueled his desire to start his own Gracie School. He established his branch in Copacapana, Rio de Janeiro and started to build his own group of students and fighters. Carlson had a very important role in stimulating the competitiveness in Jiu-Jitsu that further contributed to the technical development of the art. Very competitive himself, Carlson built a strong team of young athletes that had a remarkable performance on the 70’s and 80’s at the already many emerging Jiu-Jitsu tournaments held in Brazil. Roles ? as friends and family called him ? was another Jiu-Jitsu genius who added an enormous contribution to the development of the art. According to Master Carlos Gracie Jr., Rolls was the link between the “old Jiu-Jitsu” and the “modern Jiu-Jitsu” practiced today. More than that, Rolls played a key role in maintaining Jiu-Jitsu as an important sport in Brazil. In the 70’s, the country was under turbulent political times established by the military dictatorship and Jiu-Jitsu was losing its glamour since the media coverage was not as strong as it was previously. Using his talent, charisma, and leadership abilities, Rolls influenced an entire generation of young people in Rio de Janeiro towards the practice of Jiu-Jitsu and a healthy lifestyle. Rolls started training Jiu-Jitsu as a little kid and at the age of 12 started to help his uncle Helio with classes at the Gracie School. Rolls was also really close to Carlson, his older brother, from whom he learned a great deal as well. Extremely talented and committed to training and achieving his full potential as a fighter, Rolls Gracie also had a very open mind and strong desire to learn whatever he could to make his Jiu- Jitsu better. What impressed many was not only his physical quality and sharp techniques, but also his strong character and commitment to becoming the best he could be. During his teenage years, Rolls had the opportunity to visit many different countries where he learned Sambo, Judo, and Greco-Roman Wrestling. A black belt at the age of 16, Rolls grew into a solid and cut young man with a great vision for Jiu-Jitsu and his career as a fighter and instructor. One of the ways he found he could grow the sport was by competing in tournaments as a way to engage more people in the sport. 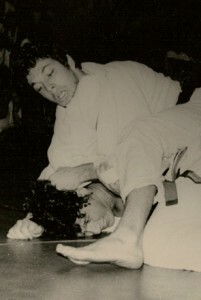 In 1976, Rolls participated in his first No Holds Barred (Vale-Tudo) Fight. He took the fight after a Karate Instructor challenged him by questioning the effectiveness of Jiu-Jitsu during a TV show demonstration. The challenge was promptly accepted and many matches were arranged between Jiu-Jitsu fighters and Karate Fighters. All Jiu-Jitsu fighters won that night, but the main event was certainly the one to catch more attention. Rolls Gracie and the Karate Master fought for a few minutes with Rolls applying a beautiful take down, controlling his opponent’s back and finishing the fight with a rear naked choke. Rolls also started his own Gracie School following a pattern created by Carlson that would soon be followed by many members of the second generation of the Gracie Family. Being so close to Carlson, Rolls shared the same facility with him where they would teach on alternate days. Unfortunately, Rolls had a lot left to do, but was unable to finish it all. His legacy still lives strong among us. At the age of 31, Rolls Gracie passed away in a hang gliding accident on the mountains of Rio de Janeiro. Carlos Gracie Jr. was born in January, 1956 and grew up under the strong influence of his family of fighters. Really connected with the life philosophy and teachings of his father Carlos Gracie Sr., Carlinhos – as friends and family called him ? grew up observing and learning from some of the most influential characters his family ever created: Carlos, Helio, and Rolls. The most important years of his childhood and early teenage years were spent at the famous Teresopolis House ? a huge ranch with several rooms where most of Carlos’ and Helios’ son lived and trained together for many years. There, Carlos Gracie Jr. learned how to live in a community in which all members needed to get along, share, and learn from each other. This seems to have become an ideal for him. In many ways, Master Carlos is replicating that lifestyle on a larger scale today, through the same environment that nurtured his personal development at the old Teresopolis House. Carlinhos was always a very technical fighter and inherited the open mind of his brother Rolls. His vision that a fighter should always rely on technique and be well-rounded was clear to note at a young age due to his dedication to mastering Take Downs from Judo and Wrestling, Self-defense techniques, and, of course, the many recent technical jiu jitsu developments introduced by his brother Rolls, among them the open guard. Carlos Gracie Jr.’s dedication to the sport and lifestyle of Jiu-Jitsu would go side by side. He enjoyed training, teaching, and learning from his brothers and cousins, and also competed extremely well in many Jiu-Jitsu tournaments. But he was also really intrigued by the teachings of his father Carlos and was becoming more and more dedicated to developing the Gracie Diet as a way to support his family’s athletes and to cure diseases. Carlinho’s curiosity led him to pursue a college degree in Nutrition Sciences to deepen his understanding about the influence food could have on one’s body. Master Carlos Gracie Jr. began to teach at the main Gracie school in Downtown Rio de Janeiro, like many of his cousins and brothers. He worked along side his older brother Rolls and Cousin Rorion, from whom he learned a lot. Eventually, Rorion decided to live in the United States, and Rolls established his school in Copacabana, while Carlos Gracie Jr. was called upon to assume the responsibilities of running the School with his cousin Rickson Gracie. After two years as one of the main instructors at the main Gracie School, Carlos joined forces with his brother Rolls as his school was closer to the university he was attending for his degree in Nutrition Sciences. After working as Rolls’ assistant instructor for seven years, Carlos was hit by the news of his brother Rolls’ death. During that situation, all of the students got together and, together with Rolls’ wife, asked him to assume the responsibility of continuing the path that his brother Rolls had began. The school originally had about 20 students, and grew to almost 200 after the first year. Gracie Barra then moved the school to a larger space inside of a gym, where we are still located today. Gracie Barra was a unique school from the beginning. Carlinhos developed a very special teaching style and philosophy that supported the development of students to their potential. Although his team grew to become the most competitive and accomplished ever, collecting multiple world titles, that was never his main goal. 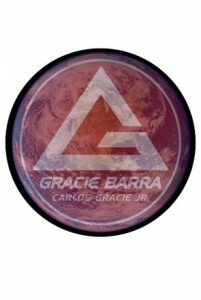 Many great athletes, doctors, engineers, surfers, and other people from different backgrounds found the Gracie Barra school a friendly and supportive environment where they could not only learn exceptional Jiu-Jitsu, but also be influenced and mentored by Carlinhos with his strong lessons about healthy habits and a balanced lifestyle. Along with his duty of building Gracie Barra into one of the most competitive and accomplished team of instructors and athletes, Carlos dedicated a lot of his time to establishing the Brazilian Jiu-Jitsu Federation, an entity created to regulate the sport in Brazil, unite the state federations under one set of rules, and organize a national championship. Carlos’ commitment to the growth and organization of the sport has been remarkable and essential in allowing the organized expansion of Jiu-Jitsu worldwide through the establishment of the International Brazilian Jiu-Jitsu Federation. 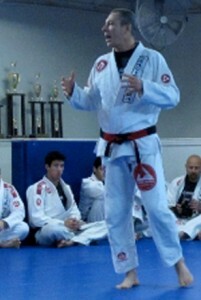 Master Carlos Gracie Jr. continues to be very active at Gracie Barra. He is fully involved in mentoring and giving direction to the GB Leadership Team ? built by some of his closest students ? who run the organization on his behalf. One can easily find Carlinhos training daily at our Head Quarters. His simplicity allows him to blend in with the rest of the students, and only a trained eye would be able to find him wearing his GB Uniform with a red and black belt around his waist. After working for many years as an instructor at his Uncle Helio and then his brother Rolls school, Carlos wanted to pursue the dream of having his own school. 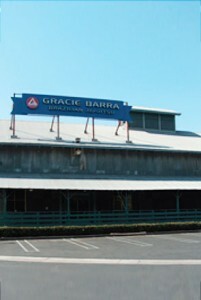 But it was not until 1986 that Gracie Barra was officially founded – on the same building that it stands today. During the 80s, the Jiu-Jitsu had a very strong focus on tournaments and the Carlson Gracie Team performing really well winning most tournaments. Excited by the building of a school that would live up to the legacy of his brother Rolls, Master Carlos Gracie Jr. accepted to him self the challenge of building a team of young Jiu-Jitsu fighters that would slowly take away Carson’s hegemony and dominate the competition scene on the 90s and 2000s. Master Carlos did that though without never loosing sight of his personal philosophy that he developed from the lessons learned from his father. He envisioned Jiu-Jitsu as a tool to support any person individual on the quest to achieve his or her potential. He believed teaching in such a way, the most talented and dedicated people would naturally develop to become great athletes. On Gracie Barra mats, some of the toughest Jiu-Jitsu champions were made and countless doctors, engineers, lawyers, and all kids of people from different ages and background found a positive learning environment they could learn exceptional Jiu-Jitsu techniques and be inspired by Master Carlos Gracie Jr.’s ideals of healthy leaving, good diet, and great friends. The roots of the sport of Jiu-Jitsu can be traced back to the first generation of fighters of the Gracie Family. While Carlos and Helio remained mainly in Rio de Janeiro during their prime years as instructors, Oswaldo and George moved to different states within the country and started their own branches of the Gracie School. With time, each one of these branches naturally generated new instructors and the schools continued to pass along their Jiu-Jitsu knowledge. That process continued and was accelerated when the second generation of fighters from the Gracie Family started their own schools, mainly Rolls and Carlson, in the 70’s. By the last few decades of the 20th century, there were enough schools and competitors to have numerous tournaments, with most of them taking place in Rio de Janeiro under the tutelage of the Jiu- Jitsu Federation of that State. During the 70’s and 80’s, tournaments served the purpose of stimulating students’ commitment to training, learning, and excelling in the art of Jiu-Jitsu. The rivalry among schools over who was going to win the next contest fueled the motivation of young students, which helped the growth of the schools and the sport in general. In 1994, Carlos Gracie Jr. launched a strong initiative to gather support to start the Brazilian Jiu- Jitsu Federation, which created uniform rules for tournaments and organized the first Brazilian Nationals Championship. 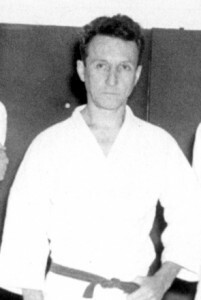 The work of the Jiu-Jitsu Instructors, the Brazilian Confederation, and the state level federations to organize tournaments, define a common set of rules, and institutionalize Jiu-Jitsu as a national sport in Brazil, were crucial to maintain the identity of the sport and keep Carlos Gracie Sr.’s legacy alive. While Jiu-Jitsu evolved to never before achieved levels of technical development in ground fighting in Brazil, all the other disciplines like Karate, Tae Kwon Do, and Judo became really popular due to Hollywood movies and the Olympic games. While those martial art styles have great techniques, they are restricted to just one aspect of real combat and only work under a set of rules that ensure the circumstances in which the techniques are effective. Generations of martial artists spend many years learning one aspect of fighting (i.e. striking, take downs, or pinning), believing that would be sufficient under real combat situations. 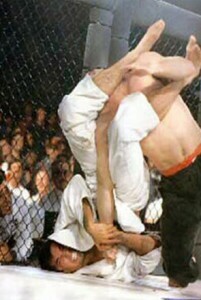 In 1993, that assumption faced its most challenging test when Rorion Gracie put together the first Ultimate Fighting Championship (UFC) as a contest between athletes from different martial art styles. The world was shocked when a lighter and “apparently” weaker Royce Gracie defeated all his opponents by fighting mainly on the ground using choke holds or joint-locks to make his opponents give up the fight. Suddenly, martial artists from all different backgrounds realized if they did not know Brazilian Jiu- Jitsu, all they knew about fighting was worthless against a Jiu-Jitsu fighter. That realization triggered what many call the Brazilian Jiu-Jitsu revolution in martial arts. A big shift of focus and training towards ground fighting followed. Such an impact in the martial arts world caused a high level of demand for Jiu-Jitsu instruction in all corners of the world. Qualified Brazilian Jiu Jitsu Black Belts were invited to many different countries to teach seminars to those who were intrigued by this dominating fighting style they had never seen or heard about before. By this time Gracie Barra had dozens of Black Belts built through a program that valued all aspects of training: self defense, take downs, and ground game. These well-rounded instructors and athletes were offered opportunities to teach abroad and many of them accepted them, settling down in different countries. One of the first GB Instructors to teach abroad was Master Roberto Maia in the city of Boston, Massachusetts. Others followed like Master Marcio Simas in Orlando, Florida, and Professor Eduardo Lima in Tampa, Florida. Later, many Gracie Barra Black Belts contributed to the globalization of our sport. It is important to also note the contributions of Professor Marcelo Resende in Australia, Professor Ze Radiola, Master Mauricio Robe, Professor Vinicius Dracolino Magalhaes, and Professor Aldo Caveirinha Janoario in Europe, and Professor Nao Takigawa in Japan. Carlos Gracie Jr. taught Jiu-Jitsu as a means to instill a healthy lifestyle in his students. He knew how much the art could add to one’s character and understood that to continue the legacy of his father, uncles, brothers, and cousins he needed to build leaders prepared to live up to the values, principles, philosophy, and techniques being passed on to them. As his black belts were graduating, it was natural for them to want to continue their paths in Jiu-Jitsu, embrace the challenges of becoming instructors, and do for their students what Master Carlos Gracie Jr. had done for them. As they came to Master Carlos to ask for his permission to teach under Gracie Barra, they not only got his consent, but his support as well. Carlos encouraged all of them to start their own schools, sometimes really close to his main school, sometimes in other continents. Without formalities, but with a strong intent and personal commitment, what we understand today as the Gracie Barra Brazilian Jiu-Jitsu Schools Association was born. GB Instructors continue to travel to many different places to establish schools and keep the Gracie Barra Legacy alive. 2005 – Headquarters in the U.S. In 2005, Master Carlos Gracie Jr. decided to make an unexpected move. Realizing the great potential Jiu-Jitsu had in the United States, he moved the Gracie Barra Head Quarters from Rio de Janeiro to the city of Lake Forest in California, U.S. Arriving in the U.S., Master Carlos Gracie Jr. had the opportunity to start from scratch again, but this time, with all the knowledge he had acquired building one of the most accomplished Brazilian Jiu-Jitsu schools in History. With the help of Black Belt students sent from Brazil, Master Carlos embraced the challenge of creating, what he believed to be, the perfect school: a prototype to serve as a lab experiment for the best training, teaching, and management practices, and as a reference for GB schools and instructors all over the world. 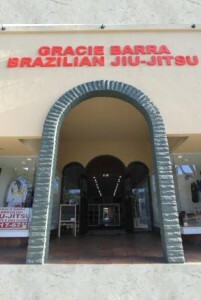 Gracie Barra America grew from a small warehouse in Lake Forest to a big two-story facility with over 7,000 square feet and several hundred students located in Irvine, California. 2006 – GB Association is formally founded. Along with the development of the Head Quarters in the U.S., there was a strong need to create rules, procedures, and standards for the Gracie Barra Schools spread all over the world to follow. The organization grew too big for only one man to control and communication had become a challenge. Master Carlos could not meet one of his instructors for years due to the geographical distance between them. In order to formalize the relationship with the schools and set standards to ensure Gracie Barra continued to be represented on the highest level, Carlos founded the Gracie Barra Association in 2005. Many instructors from different parts of the United States were called for a meeting in which they committed to basic standards and procedures that would create consistency and quality instruction at all GB schools. Once Master Carlos Gracie Jr.’s expectations were set by the rules and guidelines of the Gracie Barra Association, the focus shifted to developing support tools to facilitate the schools’ compliance with their obligations. As time went by, the GB Association became a source of information, and they helped support Gracie Barra schools all over the world in achieving their potential growth and quality instruction. Master Carlos realized his association could be more than a regulating body that investigated schools’ compliance with his standards; it could also be a primary source of knowledge that would support instructors all over the world with growing their schools, building great students, and helping their communities embrace a healthy lifestyle. Once Gracie Barra America established itself as GB’s headquarters, many GB black belts settled at the school to meet and learn from Master Carlos and his team of instructors. As the school’s teaching and management systems became well documented, the time came to start replicating that school in other cities in the region. Surrounding cities like Santa Ana, Costa Mesa, Huntington Beach, Yorba Linda, San Clemente, Garden Grove, and many others were chosen by the GB Black Belts living locally, to start their own schools. Today, there are several dozen Gracie Barra Schools supporting each other and spreading Jiu-Jitsu in the region. Just like it evolved in Barra, these schools, instructors, and students benefit from each other’s work efforts in introducing BJJ to a new community, providing volunteer projects at local schools, and training for upcoming tournaments. The Gracie Barra Association needed make sure the lessons learned during the development of GB America were getting to the instructors establishing satellite schools. The proximity between the branches and the Head Quarters made the need for uniformity, high quality, and consistency among the schools even more important. Additionally, Master Carlos Gracie Jr.’s teaching methods and philosophy had to be replicated in the best way possible, along with the same instructor’s training experience at each one of the schools. To accomplish this, the Association launched the Gracie Barra Premium Schools Program, which focused on making available all teaching, management, and training tools used by GB America in a clear and consistent manner. The program has been very successful in supporting the growth of schools, and ensuring consistency and quality instruction. It has also established a new type of relationship between the Association and the schools that is more beneficial to both parties. The premium program is currently starting to be replicated in other states in the U.S. and other countries. 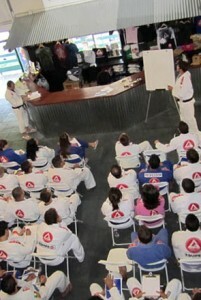 Gracie Barra has turned into a worldwide organization. Depending on the demand for Jiu-Jitsu and leadership of the people involved with the sport locally, regional growth can happen quickly and then the need for the establishment of a local office emerges. Although GB is a global organization, the reality of each school is local, and so are the challenges they face. To better support the growth of local schools all over the world, Gracie Barra is committed to creating regional divisions that work closely with the instructors and students for the optimal growth of the schools and quality instruction. 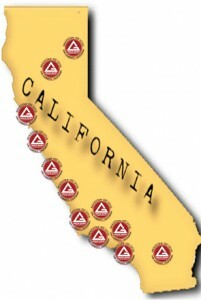 Gracie Barra currently has regional divisions responsible for North America, Oceania, Europe, and Brazil. Some of Master Carlos’ closest students live locally and run the office dealing with the schools on a daily basis. One school in each City in the Worldsaid Master Carlos Gracie Jr at the end of one of the most important Gracie Barra Instructors Meeting held at our Head Quarters in Irvine, CA in March, 2010. While this vision may sound ambitious today, our entire organization and its people are adapting in the pursuit of this goal for the many years to come. The Gracie Barra team is dedicated to bringing the art of Brazilian Jiu-Jitsu to hundreds of thousands of people worldwide through the hands of qualified instructors. The establishment of GB’s Franchising Program in 2010 was one of the most important accomplishments on our recent history. Through the systems and tools of this program, we will be able to provide the kind of support schools and instructors need to hundreds of people within their communities with the Brazilian Jiu-Jitsu Lifestyle. The Gracie Barra Franchise Program started in California and is now available for schools in 38 different states in the US including Texas, Florida, Hawaii, New Mexico, Louisiana, Tennessee, Misouri, and many others. We are working hard to expand its reach to other areas in the US and worldwide. This is just the beginning… ~ Master Carlos Gracie Jr.